Simple herbal cures can bring trees back to life. Kamleshwar Nath believes. 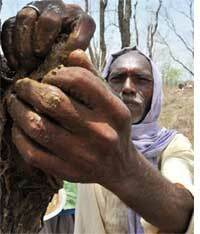 He has been healing trees in Sonebhadra district of Uttar Pradesh for 20 years now. The task before Baba, as the 55-year-old is called, is to save the forest in his village, Nagwa. Baba's remedy, said the villagers, saves trees from termite attacks and from drying up; even stubs of felled trees bear shoots. "I prepare a paste using multani mitti (Indian Fullers earth), bark of trees like babul (acacia) and mango, leaves of neem, herbs like hadjor (Cissus quadrangularis)and mix it with cow dung and urine," said Baba as he walked to a nearby forest patch. The forest mostly comprises sidha (benteak), jamun and khair (black cutch) trees. "Most trees in the forest have multiple trunks. They have grown from stubs of trees felled in the 1980s and were almost dead," he said. "The paste provides moisture and nutrition to the stub and helps it regenerate. It takes a long time, eight to ten years, for shoots to emerge. But the trees do heal and recover." Just before the monsoon, considered the best time for the therapy, Baba and a few others from the kharwar tribe venture into the forest looking for broken and diseased trees. The kharwars have inherited the knowledge from their ancestors. "Seventy per cent of the trees we had treated have recovered," said Harikishen Kharwar. He is the president of Janta Jangal Samity (jjs), a village body formed in 1985 to restore the forest villagers had cut it down in the early 1980s to prevent their village being declared forestland. "The forest department declared the village a reserved forest area under the Indian Forest Act, 1927, and asked us to leave. We had heard of instances in nearby villages where some forest officials had taken over the forestland and sold it to private parties," said Baba. Irate villagers started felling trees in the forest and the move helped. Forest officials backed off. Mission accomplished, the villagers decided to bring the forest back to life. The forest, spread over 26 hectares, was guarded by four jjs committees. The task of healing trees was delegated to the kharwars, who have regenerated 190,000 felled trees by now. "Forest officials want to start a joint forest management programme with us," said Ishwari Prasad, former headman of Nagwa. "We don't want any interference. In 2008, we applied for community rights over the Nagwa forest under the Forest Rights Act, 2006."